My brother Jonah's dream has come true. We have FINALLY landed in his favorite fairy tale: Jack and the Beanstalk! It's a lot of fun meeting Jack. But then we accidentally mess up his story, which means Jack can't climb up the magic beanstalk to find the giant's riches. It's time to take matters into our own hands. Otherwise, Jack won't get his treasure, and our troubles will be GIGANTIC . 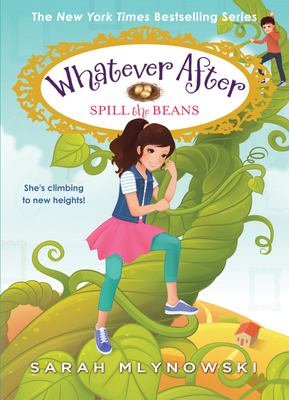 . .
Sarah Mlynowski is the New York Times bestselling author of the Whatever After series, the Magic in Manhattan series, Gimme a Call, and a bunch of other books for tweens and teens, including the Upside-Down Magic series, which she cowrites with Lauren Myracle and Emily Jenkins. Originally from Montreal, Sarah now lives in the kingdom of Manhattan with her very own prince charming and their fairy tale-loving daughters. Visit Sarah online at sarahm.com and find her on Instagram, Facebook, and Twitter at @sarahmlynowski.